Baileighs standard duty hydraulic sheet metal shears are offered in nine models ranging in widths from 52 in up to 120 in with cutting capacities of 14 gauge to 10 gauge (Mild Steel T.S. 64,000 PSI) material. These machines are great for cutting various materials such as mild steel, aluminum, stainless steel, certain plastics or Lexan sheets and much more. 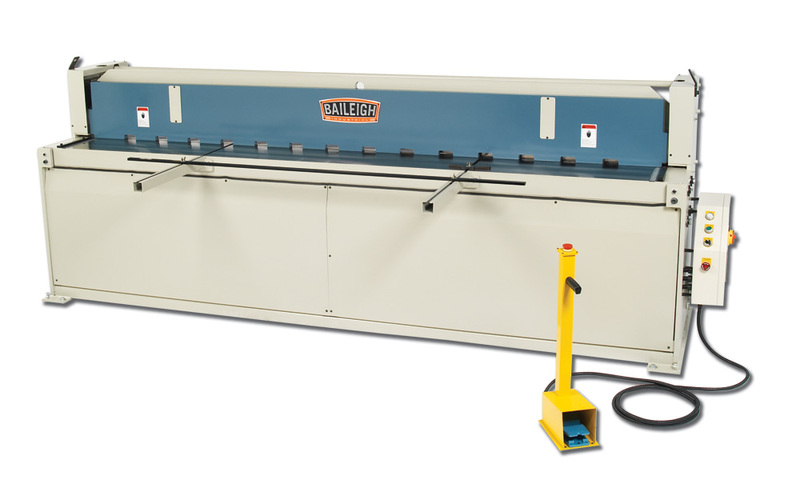 Each hydraulic sheet metal shear comes standard with front and back product supports, hand wheel adjusted and synchronized left and right metered back gauges, and a simple to use operator pendant with foot pedal controls. These sheet metal shears are equipped with high carbon chromium blades that can be flipped several times before they need to be re-sharpened which drastically increases blade life. This hydraulic shear line uses industrial grade hydraulics, industry standard electronics, and the highest quality metals and machining standards on the market. Heavy-duty electro-welded bases, frames with precision milled cutting tables (including side guides) are standard on each piece of equipment. Baileigh Industrials hydraulic sheet metal shears have been constructed for decades of use, offering the best return for your investment.